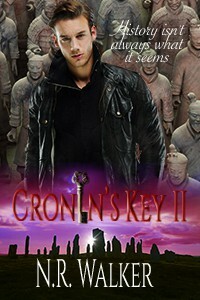 Cronin's Key II - Cristina T.
The thing that bothered me most was the repetitiveness. Cronin was growling and groaning every two pages and twice on a page. No one could get close to Alec without Cronin letting out a growl and wanting to rip their head off. And don't even get me started on Eiji's laughing/giggling/smiling/snorting/grinning and whatnot. I loved how upbeat Eiji was in the first book, but I felt like he took it too far here. He was like the friend you can never take seriously. And to top it all off, there was a lot–and I mean a LOT–of blushing and whining on Cronin's side. He came across as an inexperienced teenager, instead of the vampire who has lived for over a thousand years. Really annoying. Something else which got on my nerves was how exaggerated the history references were this time around. I mean, I loved the Egypt stuff, but now we had Jack the Ripper as a neurotic vampire, the Great Wall of China as an attempt of humans to keep vampires away, and the cherry on top: that sensation you get when you think someone has called your name, yeah, that's supposedly a vampire. *le gasp* Seriously? All these things were too far-fetched for me to believe them to even be remotely possible. I did like parts of it, though... It was awesome that we got a closer look into Alec's ancestors and the explanation for him being the key, and I liked the fact that Kole was very present and completely accepting of every weird thing that went on around him. I also liked Jorge, although I must admit that I was a little freaked out by him after his first scene with Cronin, Alec and Kennard (I loved Kennard, BTW!). But he was adorable and very helpful the rest of the time. And let's not forget my favorite scene with the lions of Tanzania, which was beautiful! Will I read the third book? Meh. I don't think so. This book's ending was very good, actually, and I'm definitely satisfied with how things turned out. I'm happy Alec was finally turned into a vampire, and he was so hot when he took charge, and especially when he manhandled and bit Cronin! Phew! And the wedding and Cronin in a kilt... Perfection! I have you, my heart.